Four hippos try to eat as many marbles as they can--as fast as they can. 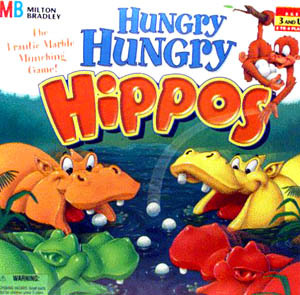 This game is fast-paced and riotous for kids who get to take turns popping a white marble into the ring, then furiously pressing on their hippo's levered tail to catch the prize. As if that's not enough, in the advanced game, all 20 marbles are released at the same time. Utter mayhem ensues, and whoever snares the most marbles wins. If only it would get kids to clean their plates as well as those pudgy hippos do.